Towel Warmer. Step out of the shower–and into a perfectly warmed towel or robe! Our spacious Towel Warmer is a great way to indulge in a little extravagance every day. It easily accommodates oversized towels–two 40″ x 70″ bath sheets at a time–as well as robes or blankets. 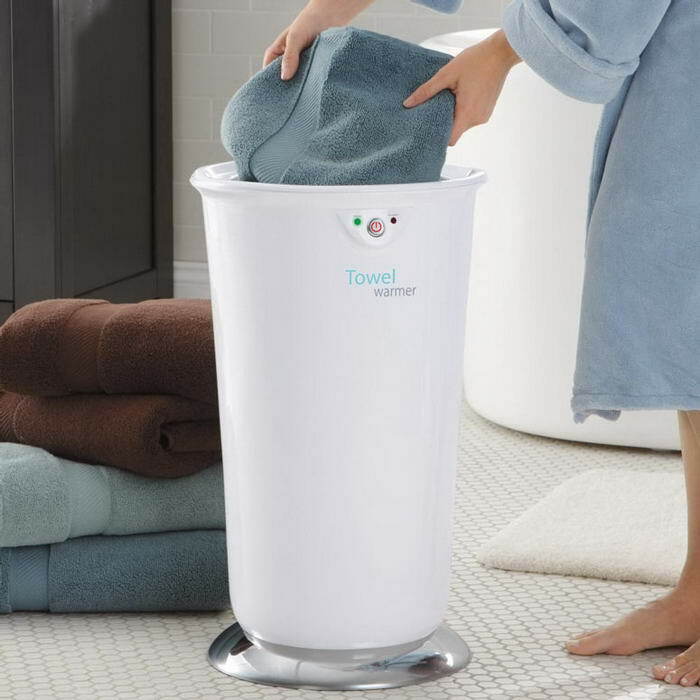 Simply place up to two bath towels inside, close the lid and press the warming button. The Towel Warmer warms your towel in just 10 minutes–and keeps it warm while you shower. It uses a safe silicone heating element to thoroughly and evenly warm the entire towel, inside and out. Its also great for warming mittens, gloves and hats before or after venturing out into the cold. Features auto-shutoff and a transparent lid that lets you see inside. Plugs into a standard 120V AC outlet. Order our oversized Towel Warmer and pamper yourself–or someone you love–with the gift of warmth!